Shame on Sportsman’s Warehouse for advertising guns on sale for Father’s Day. 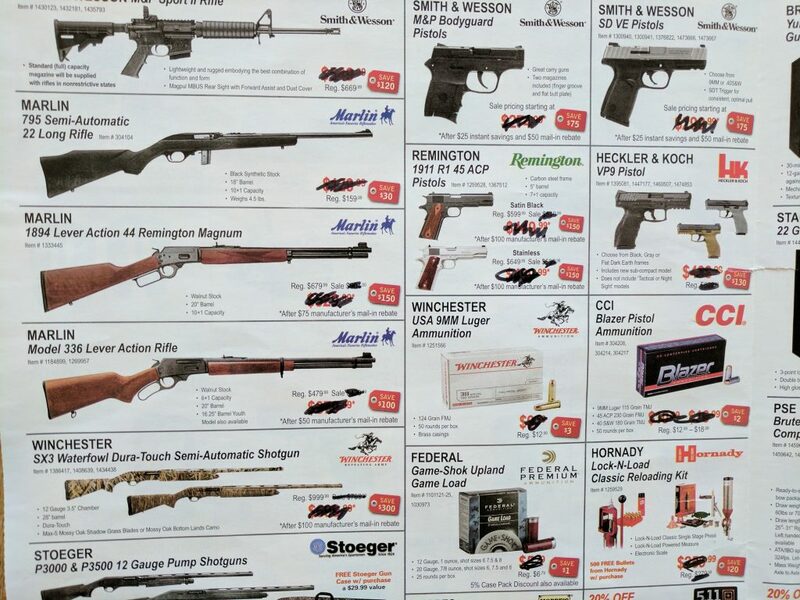 Mesa County has one of the highest suicide rates in the country, and women comprise 75% of all fatal domestic violence victims by guns in the U.S.
Sportsmans’ Warehouse ran a big ad in today’s Daily Sentinel touting a big sale on guns and ammo for Father’s Day. This does our area a big disservice. There is a huge intersection between fatal domestic violence killings and guns, and keeping guns in the home raises the risk of homicide, suicide and accidental shootings tremendously. In Colorado alone, there have been 105 domestic violence homicides by gun since 2006. The most frequent victims of these shootings are wives and girlfriends, who comprise almost 75% of all domestic gun murder victims. More than 4,880 wives, girlfriends and ex-wives have been murdered with guns nationally since 2006. Keeping a gun in the home also increases the risk of suicide factor by 17. Mesa County already has an extraordinarily high suicide rate, which is only exacerbated by the presence of more guns in more homes. An estimated 41% of gun-related homicides and 94% of gun-related suicides would never have occurred under the same circumstances had no guns been present. People claim they store their guns safely, but studies show that about 43% of homes with guns have at least one gun routinely stored unlocked. And gun accidents in the home often have horrific consequences. Just six days ago, a three year old boy accidentally shot his two year old brother in Colorado Springs after getting ahold of a loaded, unlocked gun in their home. The mother now faces felony child abuse charges. Just last November an 11 year old died from a gunshot wound to the chest in Mesa County. Several women have been shot to death in Mesa County just in the last eight months. Do we really need more guns in homes locally? Mesa County has enough problems with guns, gun deaths, domestic homicides and suicides. Do our whole area a favor and buy Dad a non-lethal gift for for Father’s Day. My daughter has a Domestic Violence Order against her ex-boyfriend. She is 5 feet tall and weighs maybe 120 pounds. He, on the other hand, is a college football player that stands over 6 feet tall and weighs in around 210 pounds or so. I am positive that he wouldn’t need a firearm of any sort to kill or maim her, but with her firearm training and experience I feel much better about her situation. If he did decide to get really stupid and she was unarmed, how much damage might he be able to inflict in the brief 5 or 10 minutes that it would take for help to arrive -IF- she managed to call 911 before he began an assault? I don’t have any statistics, but from 50 plus years of living and observing, I think that freely available alcohol is by far more dangerous to women in domestic violence situations than guns. Not to mention ruined or wrecked families and personal lives from it’s use and abuse. Car wrecks, fights, and just general bad decisions made while under the influence, fines, jail time, innocent victims that just happened to be in the wrong place at the wrong time. Why isn’t there a push to outlaw alcohol?? Even when it doesn’t do it in an instant, I’ve watched it ruin lives over a number of years to much the same effect. God created mankind. And Sam Colt made em equal. Advocating that everyone should equally have the ability to effortlessly commit violent murder is thoughtless and irresponsible. So you do think we should ban semi automatic transmissions, butcher knives, axes? How about rat poison? Or maybe we should just restrict strike anywhere matches? Of course, we could always surgically amputate everybody’s trigger finger. Every body does have easy access to those things, right? What you are advocating is not a solution, it’s an agenda. You choose to focus on how many lives are lost to evil people, instead of how many lives are saved by good people who have access to the means to stop the evil people. Perhaps there’s something missing from your equation? I think maybe you missed the whole point. Nowhere in the ad that you posted does it even say the words “Sports Authority” (a registered trade name), which is pretty much the same as blaming the atheists for a typo in the bible. And the something that you’re talking about doing is eliminating the second amendment from the Constitution. Now I fully understand why some people feel no obligation to teach their children gun safety. Considering the statistics available on lawn mower injuries, it’s just a matter of priorities I suppose. But all of that falls under the heading of figures don’t lie, but liars figure. And of course there’s always the consideration that guns don’t kill people, people kill people. But don’t get me wrong. I’m totally in favor of gun control. Probably for more than any other reason; I have mine but there are a lot of folks out there that I would just as soon didn’t have one, if you know what I mean. I corrected the name of the store. Thanks, AP. And I’d be find with eliminating the 2nd Amendment, the way it is currently interpreted. It seems everyone in the country has completely ignored the part about a “well regulated militia.” The way we have enforced, or more specifically have NOT enforced the 2nd Amendment, has been a terrible mistake. There are far too many guns in the hands of crazies and irresponsible people. In fairness, the courts have determined that every citizen is considered to be part of the militia as far as the 2nd Amendment is concerned. How well-regulated it is is a matter of opinion, but the argument that the 2nd Amendment only applies to people in a designated milita is outdated. We are all in the militia as far as the 2nd Amendment is concerned. Thanks for the correction on that store name. I’m sure Sports Authority will appreciate it. You do of course realize you may do away with the second amendment but it will of course be right after the fight. And then you’d have the problem of trying to get rid of something that can be built with two pieces of pipe, a cap and a machine screw…in about twenty minutes, that will shoot nine to twelve 32 caliber projectiles in a millisecond firing a single cartridge. Give that one a little thought. As far as the good guys versus the bad guys? The best way to take care of the bad guys with guns is with good guys with guns. It’s not the gun that kills you know. It’s the trigger finger. If you would like to do something actually productive on world wide proliferation of firearms, find out who’s selling the brand new G3s and FNFALs to an army of child soldiers in Africa and probably Chicago, who are barefoot and forced into involuntary servitude. And carrying a brand new assault rifle (that is the correct name for a selective fire rifle capable of firing full auto) which costs the better part of two grand, while the kid carrying it never had two nickels to rub together in his life. Here’s a clue. Work from the end user backwards, and when you get that done, your next project can be done right here at home. Get rid of the drugs. And you get rid of the need for the bad guys to protect their turf and their profits. And that whole inner city thing will just quite naturally fall back to a Kent state roar; a manageable problem for law enforcement. Suicides are tough, probably for more than any other reason, most of them are voluntary. That’s why they call them suicides instead of homicides. Here’s a truth for ya. Most terminally ill vets who reach the point where life is pain, choose to use firearms to commit suicide. And there are two reasons for that. One is, if you do it right, it’s really, really quick. And the second reason is to avoid the red tape that accompanies our societies enlightened determination that they have the right to stop someone who wants to end their own life. When the truth is, if they really want to do it, there just ain’t no way in hell you can stop them. They can do it on the highway, they can do it by jumping off a cliff. There’s a thousand and one ways to die. And you can’t ban them all. But the first thing I would do, if I were you, is to learn about guns and gun safety so you can teach kids. Talk to people who own guns, and like owning guns. And find out why they like to own guns. The answer here is not to ban semi automatic transmissions, but rather to fix the loose nut behind the wheel. But if you want to start getting guns out of the wrong hands right away with no delay, find the fences (people who buy and resell stolen guns). There are several, even in small towns. You’ll do two things. You’ll put a bite on the interstate transportation of stolen firearms, and you’ll put about half the burglars in your community out of business. And you’ll take about 94% of the firearms destined to be in the wrong hands off the streets. When you get all of that done, call me. And I’ll have another list for you. Maybe a ban on those boom boom mini trucks. That’ might even be Constitutional. If world war three were to be fought with nuclear weapons, then world war four would definitely be fought with sticks and rocks. It’s just the nature of the beast. And that’s why a lot of people like to own firearms. They know the nature of the beast that’s out there. I posted a comment and because I provided a link it is awaiting moderation. We will see if it shows up. I think one of the very interesting portions of the article on Grand Valley suicides is this snippet. It appears that nearly 100% of these people were mentally incapacitated at the time. “Under the same circumstances” Meaning it still would have happened, just not with a firearm. We could discuss the disparity of gun deaths per 100,000 between hunters and non hunters if you like. This was just one page of the ad. The second page, which I will now post below the blog, is full of additional guns and ammo. 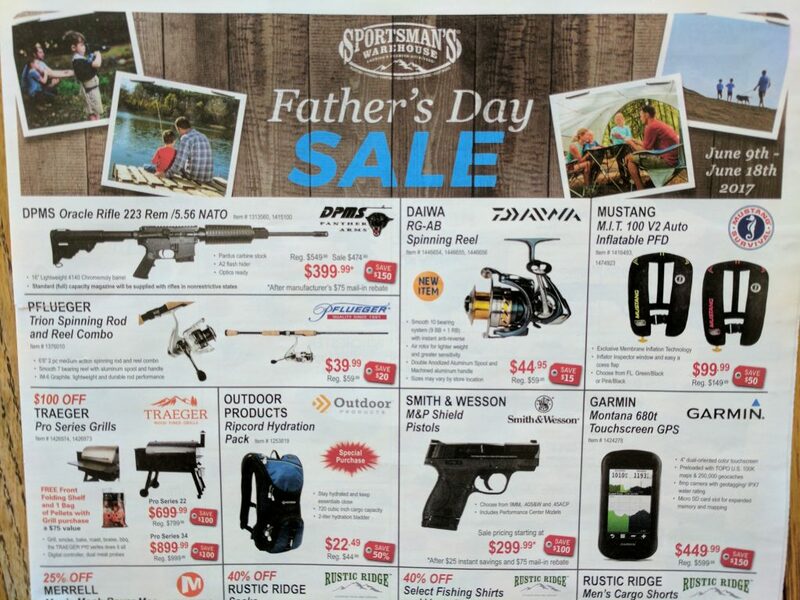 Obviously, the top of the ad says it is a “Father’s Day Sale,” and the rest of the ad is dominated by guns. “Under the same circumstances” means the suicide was completed with a gun, and had no gun been present, the person would not have shot themselves. I’m sorry but no matter how much you talk and try to justify marketing guns to families, there is no justification for pushing more guns on a society that is already riddled with gun violence and deaths. No excuse whatsoever. It’s practically criminal. I wouldn’t be too concerned Anne. I mean how many guns can the Sports Authority sell here in the valley when they closed their store months ago. And how long can they stay in business running ads for non existent outlets here in the valley? Maybe you should fix that Sport’s Authority ad reference? As far as Sportsman’s Warehouse is concerned. How successful they are will depend directly on them having in stock a little over and under survival rifle that I’d had my eye on for a long time now. But don’t worry, it’s not only safe but it’s name is politically correct; as in survival, which is something that you do when you learn not to take a knife to a gun fight. Sorry, I am definitely concerned, AP. Even alarmed. More than 7,500 children are admitted to hospitals each year in the U.S. as a result of firearm injuries. It’s time for us to be adults and step up and say out loud that something is very wrong in this country with regard to the irresponsible proliferation of guns. One of your main statements – Women bear most of the risk is patently false and a ridiculous attempt at sensationalism. You are cherry picking a tiny data set. The link below shows that males are almost 6 times more likely to be a victim. Additionally gun violence has been declining since 1999 even though there are more firearms in the US now than in 1999. Women do bear most of the risk by far. They comprise 75% of all domestic violence gun fatalities. Sorry, Ryan, there is just no way out of this one.